NATA (National Association of Testing Authorities) accreditation provides a means of determining, formally recognising and promoting the competence of facilities to perform specific types of testing, inspection, calibration, and other related activities. Accreditation is distinct from certification, which focuses on an organisation’s overall compliance with systems and products standards rather than technical competence. PQR are a ATA Accredited Type A inspection Company. PQR and trust go hand in hand; from the moment a project is entrusted with us our Inspection and QA/QC Consulting teams will do whatever it takes to ensure contractual quality deliverables are met. The PQR operational team, QA/QC Consultants and Inspection personnel are 100% accurate, thorough and professional throughout the inspection process and have 24/7 technical support as well as modern, calibrated testing equipment. 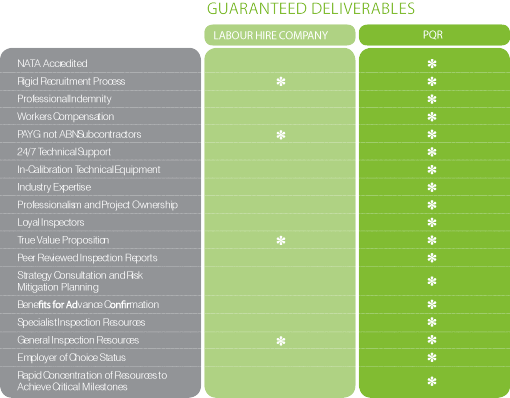 Unlike labour hire companies, you can depend on PQR inspectors to go that extra mile to meet critical delivery deadlines and to take full ownership of their job scope.